General Mills Inc. the maker of Cheerios cereal will acquire Blue Buffalo Pet Products for $8 million entering into the fast growing market of pet food to counter its dropping sales for processed foods. The acquisition was announced on Friday and is the latest by a large food company that seeks to expand into the U.S. pet food market that is estimated to be $30 billion, while grappling with low demand for its preservative-filled sugary items. CEO at General Mills Jeff Harmening said through a prepared statement that in pet food, as with human food, consumers want more premium and natural products. General Mills, which has Yoplait yogurt and Chex cereal, will pay $40 per share of Blue Buffalo, which represents a 17.2% premium to the closing prices for the pet food company on Thursday. Shares of Blue Buffalo were trading near $40 Friday morning, while shares of General Mills dropped 3.7%. Analyst said for General Mills the deal was too costly. The stock at Blue Buffalo has climbed by 58% in just the last six months. One analyst on Wall Street said that the strategic merit is strong, but the price was too steep and the cereal maker will need to do some hard work to extract value out of the deal. The analyst wonders if General Mills can properly fold the pet food company into its mix after having problems with growing Yoplait that it acquired back in 2011. J.M. Smucker, Nestle, or any maker of processed food looking to gain a foothold into the pet food industry may make a counter offer to acquire Blue Buffalo, said another analyst on Wall Street. Other companies trying to gain a foothold into the lucrative industry of pet care include Nestle, Cargill and Mars. Mars, which is the maker of Whiskas and Pedigree pet foods, acquired VCA the animal hospital company last year for $7.7 billion. At the same time, Cargill, the agricultural giant acquired Pro-Net the maker of pet food. Nestle called the industry an area of high-growth for investment. U.S. retail sales for pet food rose more than three times as quickly as the growth in sales of 1.2% for packaged food in 2017. 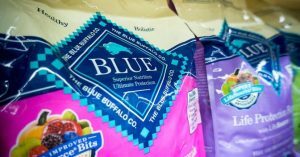 Founded in 2002, Blue Buffalo takes in over $1 billion each year in sales, thanks to strong demand for its BLUE brand of pet food that is made using whole meats, vegetables and fruits.